Another renovation on a historical downtown building is nearly complete. The 23-story Liberty Tower, 120 W. Second St., is getting upgrades to its lobby that will transform the former bank into an art deco-inspired event venue, The Grande Hall. 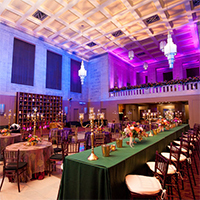 Those booking the 22,000-square-foot facility will have use of the main floor, balcony, mezzanine areas with smaller rooms that could be used for bridal or conference suites, and a large, refurbished bank vault with custom seating and coin flooring. The lobby has 35-foot ceilings, original art deco features, marble floors, large arched windows and a historical boardroom with a fireplace. Those interested in booking events at The Grande Hall should contact the venue online or call (937) 559-4590.